Located at the Cornell Orchards in Ithaca, this replicated variety trial was planted in 2015. 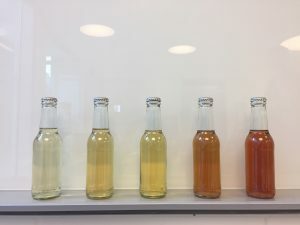 The project seeks to identify European cider varieties that are highly productive, adaptable to high-density orchard systems, contribute desired flavors to ciders (i.e., astringency, bitterness, acidity, and/or volatiles), and are well suited for New York’s climate. Varieties in the trial include: Binet Rouge, Brown Snout, Brown’s Apple, Dabinett, Ellis Bitter, Harry Master’s Jersey, Porter’s Perfection, Tremlett’s Bitter (Geneva Tremlett’s), and Vilberie. The varieties are each replicated four times in a completely randomized design. 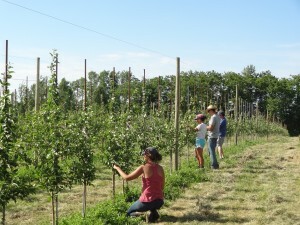 The trees were planted 3’ between trees and 12’ between rows and are trained as a tall spindle. Data generated from these field evaluations will benefit both commercial apple growers and cider makers by identifying the top performing European hard cider cultivars for New York. 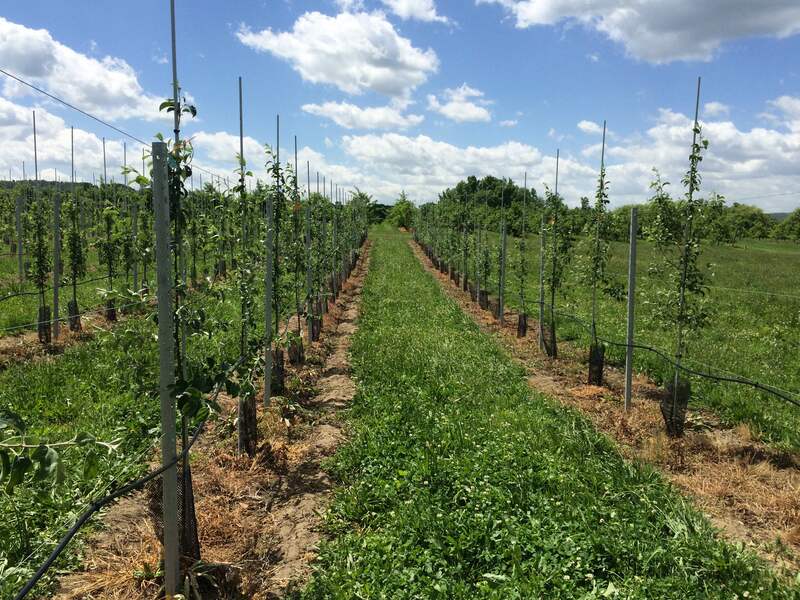 This NYS Apple Research and Development Program sponsored project seeks to increase the reliability and profitability of growing European hard cider apple cultivars in New York. Objective 1 will determine the appropriate crop load density (number of fruit per unit tree size as measured by trunk cross-sectional area) for more than 10 of the most widely planted European cider varieties. 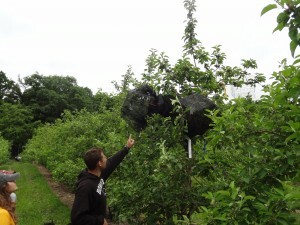 Objective 2 will determine the appropriate harvest timing for these same European cider varieties. The experiments will be conducted on established cider apple trees at the Cornell Orchards Research farm in Lansing, NY and three-year-old trees at LynOaken Farm in Lyndonville, NY. Craig Kahlke and Mario Miranda Sazo from the Lake Ontario Fruit Team are collaborating with Dr. Peck on this project. Through this Virginia Wine Board funded project, we aim to assess the impact of harvest maturity on cider apple quality. Similar to grape-based wine production, cider makers want to use the highest quality fruit harvested at optimal physiological ripeness for the intended cider style. However, it is not as well understood how harvest timing affects final cider quality as it is for wine quality. Is it better to harvest apples in the pre-climacteric period, and “sweat” them, or is it better to let the apples remain on the trees until they are fully ripe? To what extent does storage time affect cider quality? The research that we are conducting will make cider producers more competitive by increasing the quality of fruit that they are using or their ciders. Dr. Peck is collaborating with Drs. Amanda Stewart and Andrew Neilson and Master’s student Bri Ewing from Virginia Tech on this project. With the growth of the cider industry, there is an increased demand for bittersweet and bittersharp apples in the United States that help provide body and mouthfeel to ciders. 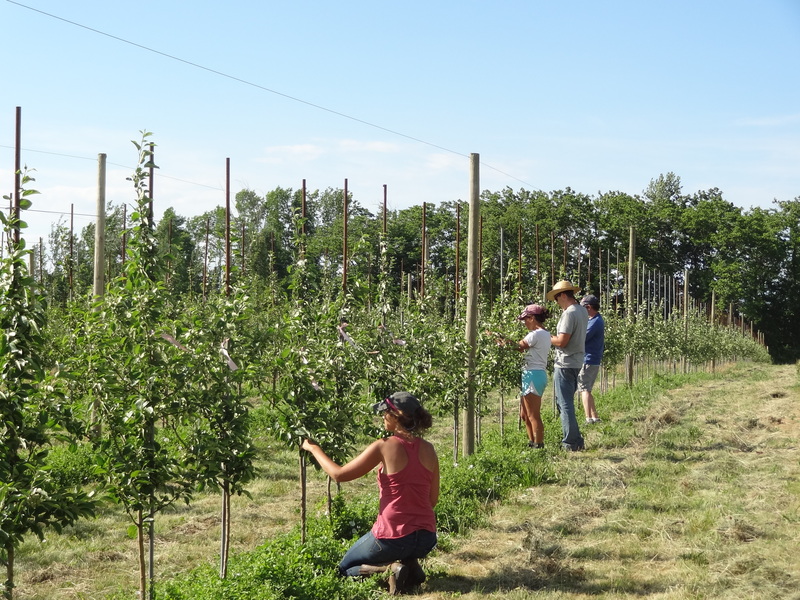 These European cultivars have not traditionally been grown in high-density orchards or in the Northeast United States, and we are interested in understanding how orchard management practices impact fruit quality. I am currently conducting several experiments studying the impact of light environment and fruit position within the canopy on the development of tannins and other polyphenols in cider apples. I have also started studies interested in understanding the impact of different nitrogen fertilization regimes on the development of tannins and yeast assimilable nitrogen in apples. The end goal of my research is to provide growers with information to help them produce higher quality fruit for the growing cider industry. In the Spring of 2017, Harvest NY surveyed members of the hard cider industry, to include apple growers, hard cider producers, and nurseries, to analyze the current state of the value chain and assess projected growth. The information contained within this report is an analysis of the survey data received. The surveys were developed through a collaborative effort among: Cornell University, Cornell Cooperative Extension Area Teams, and the New York Cider Association. The distribution of the electronic survey was made possible through the support of Cornell University, Cornell Cooperative Extension, the New York Cider Association, and the New York Apple Association. To find out more about this project contact Lindsey at lep67@cornell.edu. Tannin fortification of ciders made from dessert apples increases complexity and quality of the final ciders. Successful options to achieve higher levels of tannins include blending with ciders made from high tannin varieties, or adding commercially available tannins currently used for other alcoholic beverages. 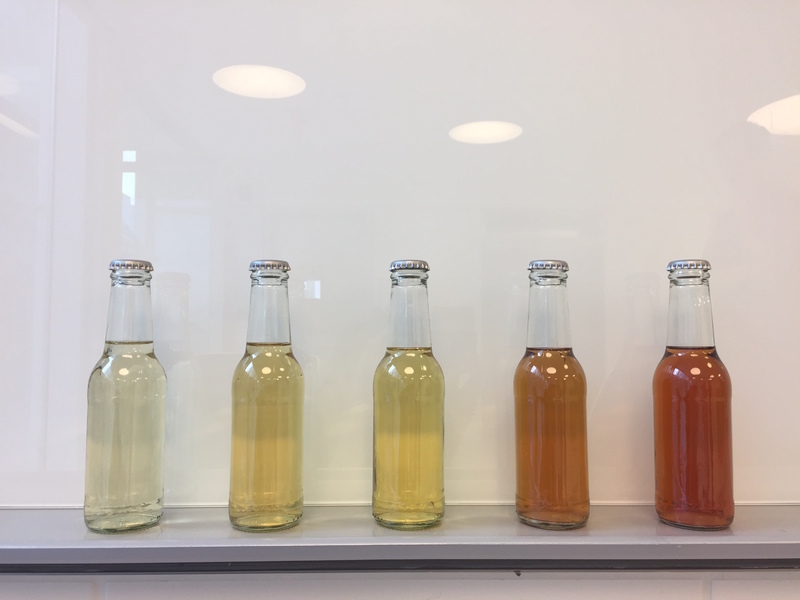 There are little to no apple-derived tannins for the cider maker looking to increase the astringency in their cider aside from growing cider apples, which presents an opportunity for utilization of spent pomace for apple tannin production. The objectives of this NYS Apple Research and Development Program sponsored project are to provide a new alternative for the cider industry. The project conducts studies to assess the feasibility of making apple tannins from dessert apple pomace and from cider apple pomace. 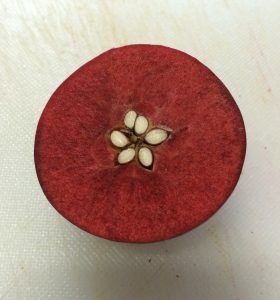 The price premium for bitter cider apples is primarily driven by a lack of supply for this specialized fruit. While the U.S. is the second largest apple producer in the world, there is a difference between the commercially grown culinary apples and bitter cider apples. All apples contribute sweetness, sharpness, and bitterness to ciders, but specialized cider apples can have 5-10 times more tannin (a bittering group of polyphenols) along with higher levels of acidity (sharpness) compared to culinary apples. It is the balance of these characteristics that make cider apples more desirable for hard cider production. The purpose of this project is to phenotype (i.e., identify and evaluate the horticultural performance and juice quality) of upwards of 100 accessions in the United States Department of Agriculture (USDA)-Plant Genetic Resource Unit (PGRU) Malus germplasm collection in Geneva, NY. These apple accessions (which contain Malus xdomestica cultivars, as well as Malus species and hybrids) will be evaluated for unique juice chemistry, as well as disease resistance and growth habits that potentially lend themselves to mechanized harvesting. 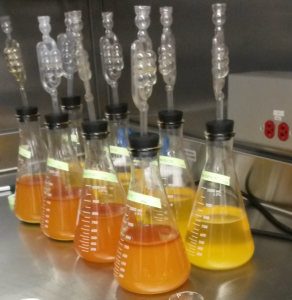 Using established protocols to characterize apple trees, fruit, and juice, this will be the most thorough screening of the USDA-PGRU Malus germplasm repository ever conducted for hard cider production.